CPS - ¿The Rest is History? Ariel Reichman at San Anton Prison. Short video from Chamber of Public Secrets venues at Manifesta 8 in Spain 2010. Produced by GUTS. Michael Takeo Magruder at MURAM. Short video from Chamber of Public Secrets venues at Manifesta 8 in Spain 2010. Produced by GUTS. 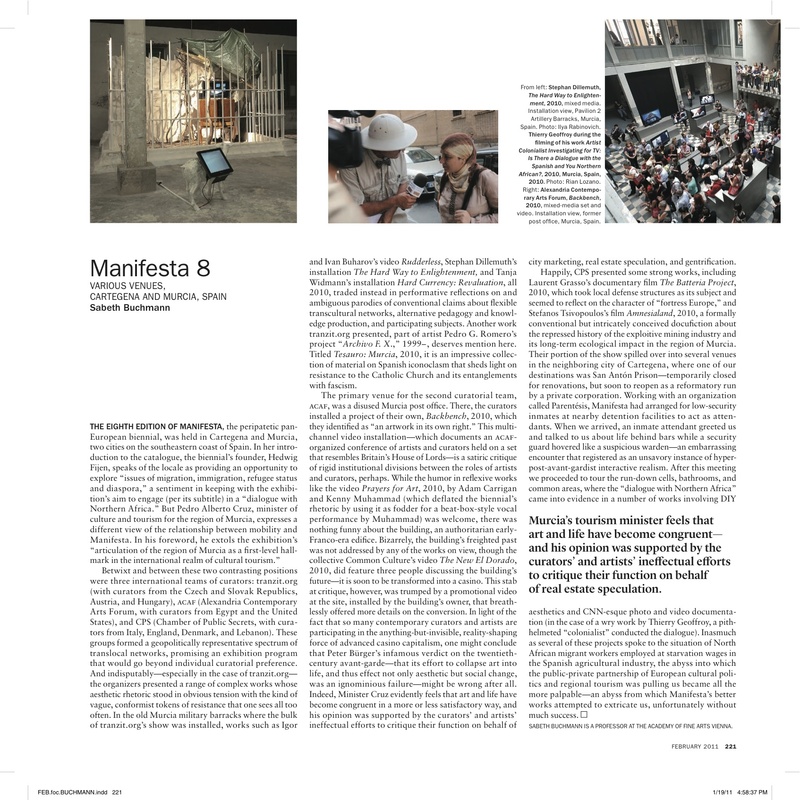 Khaled Hafez on Chamber of Public Secrets venues at Manifesta 8 in Spain 2010. Short video produced by GUTS. MURAM. Short video from Chamber of Public Secrets venues at Manifesta 8 in Spain 2010. Produced by GUTS. Erlea Maneros Zabala at MURAM. Short video from Chamber of Public Secrets venues at Manifesta 8 in Spain 2010. Produced by GUTS. Anders Eiebakke at San Anton Prison). Short video from Chamber of Public Secrets venues at Manifesta 8 in Spain 2010. Produced by GUTS. Thierry Geoffroy / Colonel at San Anton Prison. Short video from Chamber of Public Secrets venues at Manifesta 8 in Spain 2010. Produced by GUTS. Casino de Cartagena. Short video from Chamber of Public Secrets venues at Manifesta 8 in Spain 2010. Produced by GUTS. Prision de San Anton (San Anton Prison). Short video from Chamber of Public Secrets venues at Manifesta 8 in Spain 2010. 1st in a series of 11 produced by GUTS. Art Assembly. Short video from Chamber of Public Secrets venues at Manifesta 8 in Spain 2010. Produced by GUTS.